Hail in the recent days have impacted some corn acres in Manitoba. In an earlier Crop Chatter post (Assessing Hail Damage in Corn), typically yield reduction due to hail damage is a result of leaf loss. However, there can be an impact if hail injured the stalk (see Figure 1). The following information is adapted from articles “Recovery From Hail Damage to Young Corn” by R.L. Nielson of Purdue University and “Differentiating Superficial and Deeper Hail Damage” by C. Shapiro of Haskell Ag Lab. Q: What will be the impact to yield? The eventual yield effects of severe bruising or damage of the stalk tissue itself can be quite difficult to predict. Consequently, it can be difficult to determine whether to count severely bruised plants in assessing plant stands. 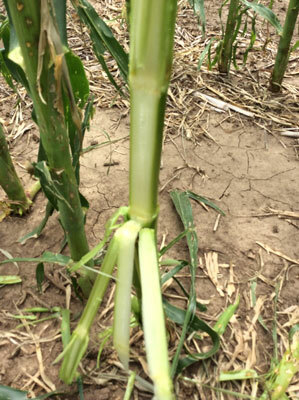 Observations reported from an Ohio on-farm study suggest that bruising from hail early in the season does NOT typically result in increased stalk lodging or stalk rot development later in the season. Early season bruising of stem tissue may, however, have other consequences on subsequent plant development; the occurrences of which are hard to predict. If the plant tissue bruising extends as deep as the plant’s growing point, that important meristematic area may die; thus killing the main stalk and encouraging the development of tillers. If the plant tissue bruising extends into the area near, but not into, the growing point; subsequent plant development may be deformed in a fashion similar to any physical damage near the hormonally active growing point. Q. How can I tell how badly damaged corn may be from bruising? Bruising is difficult to determine. You can make an initial assessment about a week to 10 days after the storm. Peel the sheaths away from the stalk and determine if the damage has actually penetrated the stalk. The outer stalk (rind) is strong and can resist some damage. However, if the stalk has brown areas, that may indicate stand problems later in the season. Cutting the stalk vertically from node to node will help determine the extent of damage (Figure 2). Brown areas in the pith where the hail hit indicate the potential for problems later in the season. The stalk in Figure 2 does not show any bruising from the pith. These areas will disrupt the movement of fluids in the plant and reduce growth. Bruised plants that show stalk damage in the pith should probably be considered as missing plants in yield calculations. Remember that estimating yield loss due to hail is only an estimate, particularly if the damage is not severe and depending upon growth stage of the plant when the hail event occurred. The remainder of the growing season will help determine final yields. Please contact your hail insurance provider for their procedures in assessing hail damage as they may be different that what has been provided here.